With Kroog in custody of Frankenstein Lois demands to know where Candice is. The alien criminal tells her that Candice is safe, locked in her basement. Superman and Frankenstein argue over S.H.A.D.E's methods but when the trans-cell arrives to contain Kroog, Frankenstein's Bride appears claiming credit for Kroog's arrest. During the argument between agents Kroog explodes, a method his kind uses to escape. Frankenstein, the Bride and Superman try to hunt down all the body parts but they can't find them all and again the two agents fight each other in hopes of being the successful captor. Superman separates them and takes the agents to hunt for Kroog while Lois races away in the hover car to get to Candice. Cobb Branden watches everything calmly from his farmhouse window. Soaring through the air Superman follows all of Kroog's parts as they reconvene in the ocean and a hidden space craft. The trio of heroes capture Kroog as soon as she attempts to get off planet. 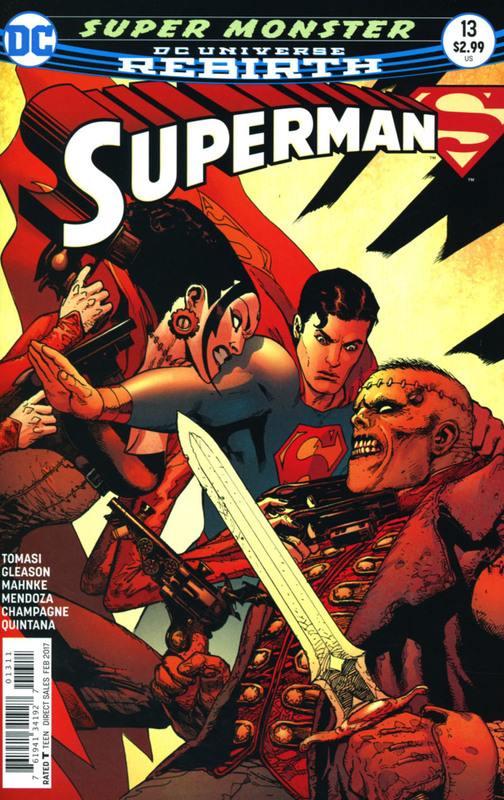 Superman crashes the ship into a prison and hands it over to Frankenstein and the Bride. Frankenstein reaches out to his Bride to try and rekindle their relationship and perhaps try for another son after they lost their first, she refuses leaving the hunter heartbroken. After an emotionally draining day with a warring couple, Clark returns home to Lois and they lovingly put Jon to bed. Story - 3: At its heart this became a story about a loving relationship, about facing problems, dealing with them and coming out stronger at the other end. The two couples are like two paths, a fork in the road. What would happen if Jon became evil? Could Lois and Clark deal with that? It was an interesting emotional beat as a story and not at all what I expected after reading Part One, but I guess after such a good run so far there had to be a story that gave you a breather and this was it. Unfortunately it was ultimately a forgettable one. The most significant element of the entire issue moving forward was that Cobb Branden is indeed familiar with aliens. Art - 5: Frustrating. The art is beautiful but there was nothing for him to flex his artistic muscles with. The most action packed page was Lois punching Kroog and it was frustrating as hell that after such an energetic first half the story faded away. I loved Clark's expression on the page, sometimes we forget that Lois Lane is more than Mrs. Superman. 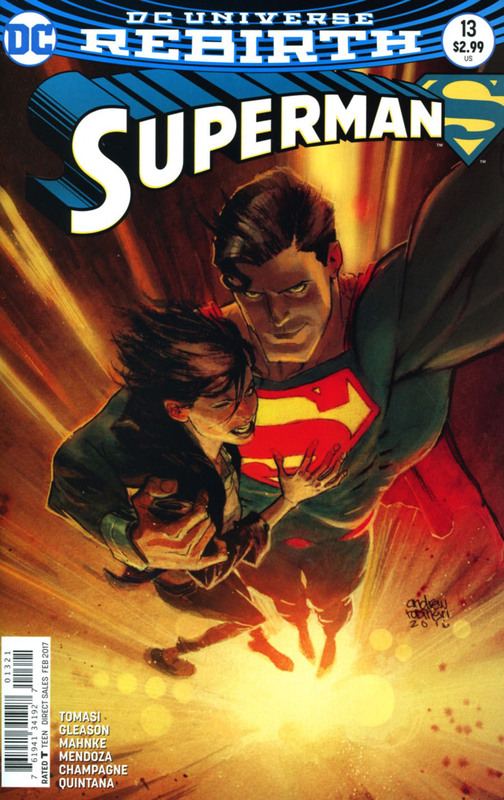 Cover Art - 4: I liked the cover, fun to see Superman stepping in as a marriage counsellor. Considering their supernatural origins I wonder how effective he would be when it turns violent! Variant Cover Art - 5: A literally SUPER cover! A difficult one to describe except to say it shows Lois & Clark having fun. Almost like a candid selfie except they are soaring away from an explosion! Orange and yellows seem to be the theme this week but in my opinion this is definitely the stronger of the two.